The event began with a presentation of the Guiding Principles for Lifelong Learning, based on the outcomes of the Interest Group meetings held since its inception in September 2015. Discussions followed on how the application of these principles could contribute to shaping the vision for a European Education Area announced by Vice-President Jyrki Katainen and Commissioner Tibor Navrascics just prior to the Gothenburg Social Summit for Fair Jobs and Growth on 17 November 2017. The Guiding Principles for Lifelong Learning encompass 9 themes: citizenship education, intercultural dialogue, critical thinking, learner-centred approaches, investment in lifelong learning, skills for the world of work, support for educators, policy coherence for lifelong learning, and sustainable development. Each of these themes comprise several guiding principles, which will be published later in 2018. The proposal for a European Education Area was widely welcomed as a positive step forward for education, training and lifelong learning at the EU level. However, many participants stressed the need for policy coherence to ensure that policies do not focus exclusively on a specific sector (e.g. schools) but encompass all levels and forms of education for a truly lifelong learning approach, and that consideration should also be given to countries outside the EU – for example, concerning the recognition of diplomas. Moreover, the lack of implementation of the 2012 Council Recommendation on the validation of non-formal and informal learning by Member States was highlighted as an important obstacle to address in making this ambitious vision a reality. Charlotte Olsson-Altansunar from the Cabinet of Jyrki Katainen, Vice-President of the European Commission, presented its political priorities for education, notably the European Education Area. “The European Education Area is widening the perspective on education and puts it higher on the political agenda. The debate on education changed after the launch of the New Skills Agenda, where a strong emphasis was put on employment. However, looking at the employment market is only one aspect of education, and the skills required for jobs might change very quickly within the next few years,” stressed Charlotte Olsson-Altansunar. “We need to promote key competences such as learning to think through non-formal lifelong learning within education and lifelong learning strategies of the European Union. 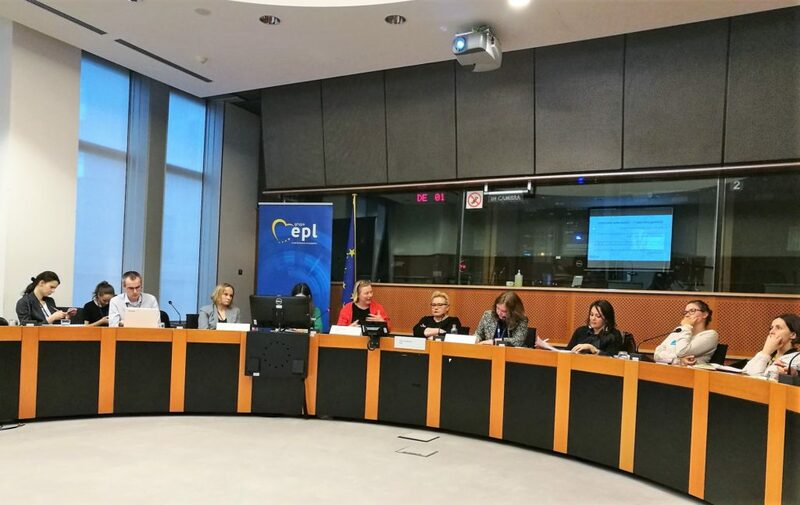 Lifelong learning will be central for the future of the European Union,” said Sirpa Pietikäinen, Member of the European Parliament (EPP) and Chair of the Interest Group. She stressed the need for a wider approach to education and lifelong learning that considers current and future social and economic challenges. Could the European Education Area potentially be a ‘lifelong learning area’? “Could the European Education Area potentially be a ‘lifelong learning area’?” suggested Gina Ebner, EAEA Secretary-General. The European Education Area may be a step into the right direction; however, it puts the focus on formal education rather than non-formal and informal learning, sectors that play an increasingly important role for the acquisition of skills and competences. “While the European Education Area focuses primarily on formal education, the Member States are encouraged to promote non-formal and informal lifelong learning in the new framework. The funding programmes of the European Union will have a focus on these sectors of education,” said Charlotte Olsson-Altansunar, Cabinet of Jyrki Katainen. She added that the Review of the 2006 Framework of Key Competences referred to lifelong learning. “It is not only about creating new strategies or frameworks for lifelong learning, but also about implementing them. We need a stronger push from the European Commission for that,” said Brikena Xhomaqi, Director of the Lifelong Learning Platform. Civil society at the national, regional and local levels is at the forefront of promoting policy-making and the implementation of education and lifelong learning strategies. “The crucial role of civil society for the European Union needs to be recognised,” said David Lopez, President of the Lifelong Learning Platform and representative of SOLIDAR. Chaired by MEP Sirpa Pietikäinen (Finland, EPP), the Interest Group on Lifelong Learning brings together civil society representatives and MEPs to discuss various key issues connected to lifelong learning. The Group aims to fight inequalities and discrimination in education in order to reach the Europe 2020 and Education and Training 2020 headline targets.